This week, the secret ingredients for Iron Chef Vegan MoFo were carrots and oatmeal. Two interesting combinations, I think, but definitely do-able! As I thought about what I wanted to make, only one thing kept popping into my head: carrot cake. But I didn't want to be that person who took the easy road and made something so... well, normal, however good it may taste. So I got creative. 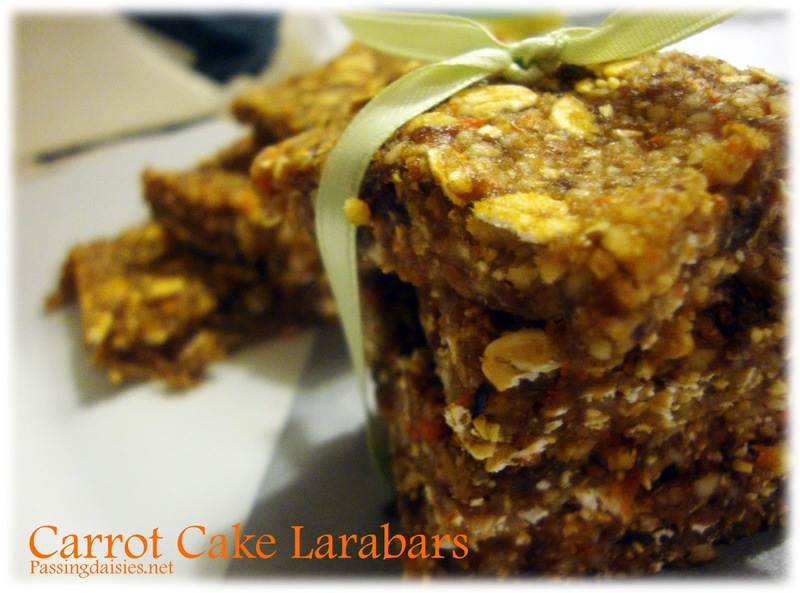 How about Carrot Cake Larabars? Everyone loves Larabars! (Unless you have a nut allergy, of course). Plus, they are easy to make because they don't require any baking. Before we get into the actual recipe, let's have a little chat. 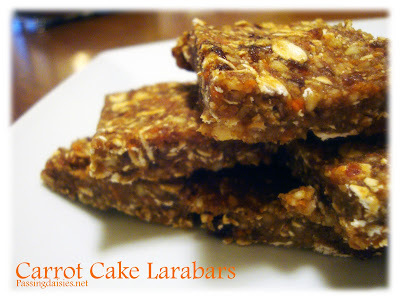 What did you think of Larabars the very FIRST time you tried them? I tried my first Larabar many years ago, before I was a vegan. I hated dates. I hated EVERYTHING about dates. But I wanted to give Larabar a chance because they had a Key Lime Pie flavor, and I LOVE key lime pie flavored anything. I was really excited to find this new key lime delight, and I remember being extremely happy as I walked out to the car with my parents. Then I took a bite. I could taste the dates. I couldn't get over it. I wanted to like Larabars, I really did, but I just hated those stinkin dates. 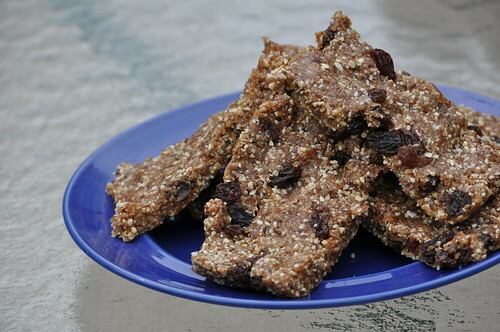 My first attempt at making Larabars came out in my Oatmeal Raisin Cookie Bars, which have since been featured on Made Just Right! Those were a huge success! So let's try my hand at another one, shall we? Makes approximately 30 two inch squares. 1. In a food processor, blend almonds until they are in small pieces. 2. Add oats and blend until most of the oats have been broken down. You may want to leave some whole just for texture! 3. Add everything else and blend until it comes together into a sticky dough. 4. Push dough into a flat container and refrigerate for a few hours or until firm. I used a cookie sheet, but you could put this into a 8x8 cake pan for better form. This means your bars will be thicker, so you'll make fewer. 5. Remove from fridge and slice into desired shape. Enjoy! So, what did you think of Larabars when you first tried them? What's your favorite flavor now? I like dates a lot but it's cool to see recipes use raisins instead because they're so much cheaper. This sounds awesome. I recently came to appreciate the pumpkin/carrot similarities too, so the spices make sense. I know what you mean about dates. I love Larabars (Lemon and the Chocolate Cherry Torte are my favorites), but a couple flavors do have an overwhelming date taste--such as the Key Lime Pie (which is unfortunate since it's the first one you tried). I like your idea of using raisins instead of dates! Thanks everyone! And good idea, Annie, about RachaelBars :) haha! I'll definitely try your recipe. I'm glad that it doesn't contain dates. I don't eat lara bars. too caloric.